It's another lovely Meatless Monday! Come link up your favorite meat free posts! This week we are getting ready for Halloween with more spooky lunches! It's just not Halloween until we've used the zombie hand! 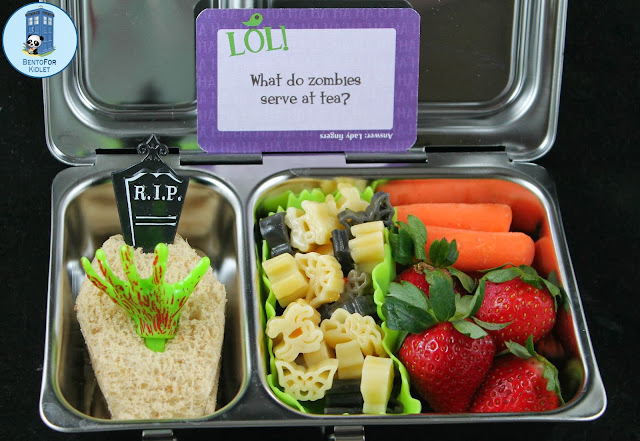 Kidlet has a grave peanut butter and jelly sandwich, pasta salad, strawberries, and carrots packed in our Planetbox Shuttle with a spooky Lunchbox Love note joke. What a great lunch, Jen! Love the spooky lunch, especially that pasta salad - looks yummmmmy - and the photograph itself is just gorgeous! Thanks so much for the linky link! Loved going thru ur bentos !!! I have a worldwide Giveaway of 2 copies of my book-"Fun Food for Fussy Little Eaters' would love you t join in ! !